The gentlemen, probably in his early to mid-50s looked like he was on his way to work. It was a busy coffee house; Boston Bean Company I believe was the name. He was a friendly guy and we struck up a conversation while waiting in line. This was our 3rd day in Boston and he could tell that we were there visiting because he overheard us talking about the ‘State House Tours’ that we were going to do later in the day. He asked where we were from. We told him Maryland and he asked what we had done so far. 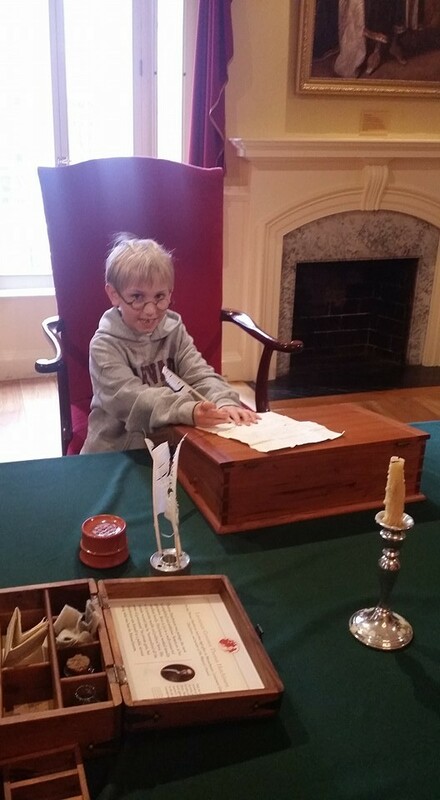 We explained that we had taken the Freedom Trail Tour, visited Faneuil Hall, gone to top of Prudential Building and that we were still scheduled to do the Duck Tour, Boston Tea Party Tour/reenactment, and State House. 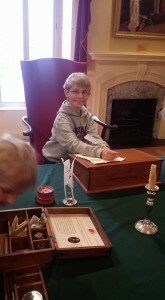 We then started talking sport and this led to a conversation about the Orioles and Red Sox. We were Orioles fans and he was a Red Sox fan. We told him that we had attended the Red Sox game a couple nights prior and that it was the Boyz first experience at a Major League ballpark. If you don’t know Fenway Park, where the Red Sox play, is the oldest park in the Major Leagues and has tremendous history and a legacy. 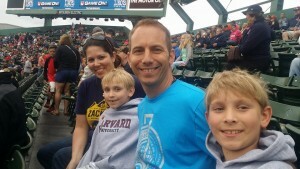 Susan and I took the boyz to Fenway to catch their first game. Before the game we had dinner at Wahlburgers, just outside the stadium. Having grown up loving baseball and watching the Red Sox over the years it has become engrained that Fenway is a special place to see a ballgame and that the atmosphere is always electric, even moreso when the Red Sox are good. (Currently they are battling the Orioles for 1st place in their division). Just as Susan and I predicted, this was the ideal place for Anthony and Alex to see their first game. The stadium was packed. The crowd was intense, even starting a ‘wave’ in the 5th inning. Everytime the Red Sox scored, they played upbeat music, to which, Alex would stand on his seat and dance. It was a memorable time for the Boyz and a great first experience. True to their personalities, Alex was all about the ‘atmosphere’ and getting the vibe for the game. Anthony, much more analytical, wanted to know the intricacies of what was happening and the strategies of the game. Could not have been a better night. If you have never been to Boston. I highly recommend a trip. This is an incredible city, with an amazing history and is the birthplace of the American Revolution with events I’m sure you have heard, The Boston Massacre (don’t believe the history books), and the Boston Tea Party. 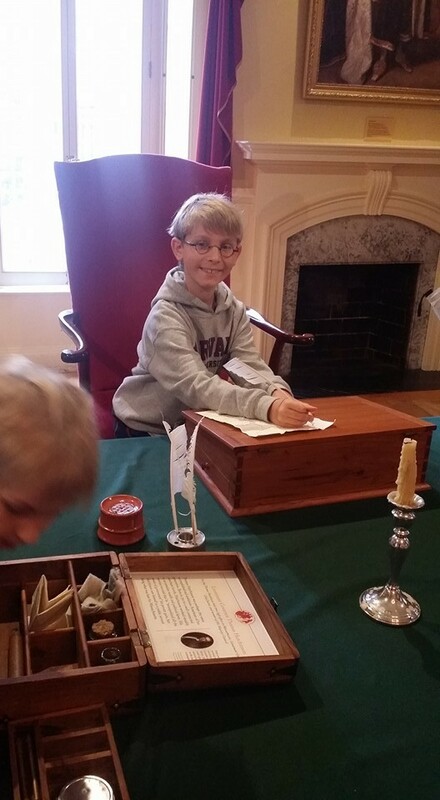 Susan and I went to Boston last summer and did all the ‘touristy’ history tours and decided that the boyz would thoroughly enjoy themselves and learn lots. That they did. Learn lots. Yes, they got to do the Freedom Trail walk/tour which is a 90-minute walking tour given by a tour guide dressed in 1700s clothing. It gives the history of Boston, how the Puritans came and settled in Boston to get away from the oppression of England. How Bostonians have always held their independence in the highest regard. How John Hancock, Sam Adams, and many others helped lead a movement that led to the American Revolution, which from that created the Declaration of Independence, our United States Constitution, and the formation of the structure of our Government. During the Freedom Trail tour, we also learned the ‘The Shot Heard Round the World’ that was named from the killings at the Boston Massacre might not have occurred as written in the history books. The tour guide, and many others during our trip to Boston said that the British Soldiers were actually ordered not to fire their guns. The crowd, an angry mob, was being riled up against Britain at the time and were gathering in front of the State House to show their disdain against the unruly hand of Britain and the Patriots main point of contention – Taxation without Representation. It was during this time as the mob was becoming more restless and was growing in size by the minute that the soldiers stood their ground under the orders not to fire. Boston had an alarm to alert its residents of a “Fire” and this alarm was sounded this night. Not because of a Fire, but to get people to the center of town, knowing that the Fire Alarm would get people there quickly to join the mob against the British. One of the theories, is that the crowd growing in size and becoming unrulier by the minute was advancing on the soldiers, who were still under orders not to shoot. Then in the melee of the evening with the Alarm going off, someone in the crowd YELLED, “FIRE!” They thought there was a fire, but the soldiers misheard and thought they were given orders to ‘fire’. They unloaded their rifles into the crowd killing 5 individuals and thus setting into action the next phase of the Revolution. The Boston Massacre strengthened John Hancock’s side against the British which led to the Boston Tea Party on Dec. 16th 1773. The night before the Free Breakfast we walked to the North End (Little Italy) of Boston to go to the top-rated Pizza house ‘Regina Pizzeria.’ There are 5 or 6 spread throughout Boston, but if you go, you must eat at the Original Regina’s in the North End. We arrived, and like the Seinfeld Soup Nazi episode, there was a line outside down the sidewalk that was 50-60 people deep. The wait to get in was over an hour. And this is not just some touristy place. The line included a lot of regulars who live in Boston. You know if locals think it’s that good to wait for an hour, then it must be good! Susan and I had visited on our last trip so we knew how good the Pizza was and were ok waiting in line with the Boyz to get seated. We ate dinner, and of course, we had leftovers that we asked the waitress to put in a box for us to take back to the hotel. On the walk back to the Hotel, we passed Fanieul Hall, the State House, and the Old South Meeting House, walking the same streets as those brave Americans (Patriots at the time). These people had such a strong believe and conviction about their rights that they waged war against the mighty British. If the streets could talk, the Stories would be even better than what we have learned on our tours. But like any major city, Boston has its issues. There are a number of panhandlers. I won’t call them homeless, because even though it is highly likely, I’m not sure. But what I do know is that you can’t go a block or two in Boston without running into one sitting on the sidewalk or asking you for money. The boyz after a couple days of walking past have become kind of desensitized to the panhandlers. As we are walking back with leftover Pizza from Regina I notice a panhandler sitting there with half of his leg amputated. As we approach him, Alex and I were walking together and Susan and Anthony were on the other side of the street. I walk up to him look him in the eye and say “here you go, enjoy” giving him a slice of pizza. He said, “Thank You.” But he had the look in his eyes, someone whom life had thrown curve ball. When he was 8,9 years old, do you think he dreamed of sitting on a street corner begging for handouts? Walking away, I explain to Alex why I gave the man a slice of pizza. I told Alex that I knew what he was going to do with the pizza. If I had given him money, he might have used it for something else. By giving him food, he had no choice but to eat it and it might help him get through the night. At the next block when the 4 of us met back up. Susan and Anthony saw what happened and Susan had the EXACT same explanation for Anthony as I did for Alex as to why I did what I did. Maybe this little moment will have an impact on Anthony and Alex and they will help someone in the future. So as the Stranger in the Coffee shop offers to buy us breakfast and I initially refuse. But upon further thinking I can teach the kids a larger life lesson… KARMA! How the universe works in mysterious ways. The 2nd time he offered, I relented. I then said to Anthony and Alex, “Boyz remember last night?” They both said that they do. I went on to tell them that this was an example of Karma. I had given a stranger pizza last night and then just 12 hours later a different stranger offered to buy us breakfast. I explained to the stranger the events of the evening before and he just smiled. I definitely have flaws as a parent. DEFINITELY!!! But the one thing that I’m looking for is little real life teaching moments that I can use to give the kids lessons in life. Ask my Boyz about Karma and they know. Is Karma really that much different than ‘The Golden Rule?’ Do good and the universe rewards you. Do bad and the opposite. Just as in life, I believe in Karma in business too. Remember the story a few months ago where I had to fire my client because there was some unethical activity going on that I didn’t want to be associated with? What I didn’t tell you is that this was probably my largest client at the time and we had 8 projects going on at the same time. All told there was well over $100,000 in commissions that I was set to earn over the next year with this client. My decision to sever the relationship with this client was made immediately once I found out the misdoings. It was in the minutes and hours that followed that I thought, “What the heck… Is this the right decision?” I went with my gut and my instincts and knew that it was the right decision even though I was giving up a large part of my income over the next few months. Well, four months after that decision, I can tell you that the number of people that are sending us business has increased. My friends. My colleagues. My guests on Frederick Advice Givers. You… are all sharing my information and my story. The referrals and business has not suffered since that fateful Sunday morning decision. However, I know how stressed they were and they didn’t plan on needing that additional money. I operate my business on the premise that I do what I say. If I tell a client something, I do my absolute best to follow through on what I say. So, I offered to give a credit off of my commission to help my clients financially. Was this the right business decision? Not sure. But, in my gut it was the right thing to do. Hopefully this small act helps relieve some stress to my clients. In business, as in life there is ‘Karma.’ I didn’t give a slice of pizza to the stranger because I thought I’d get a free breakfast the next day. I did it because it was the right thing to do at that time.